The heart is able to perform the important function of blood pumping only through the synchronized of the heart muscle fibers is lost. A method to return the fibers to its normal synchronized working is called defibrillation. It consists of delivering a therapeutic dose of electric energy to the affected heart with a device called defibrillator. Defibrillators can be external, transvenous or implanted based on the nature of device used. Depending on this fibrillation is classified into atrial fibrillation of atrial muscles and the fibrillation of ventricles is called ventricular fibrillation. Earlier mechanical methods such as heart massage for achieving synchronism of heart muscles were used. But the most successful method of defibrillation was proved to be an application of electrical shock to the area of the heart, if sufficient current is applied to stimulate all musculatures of the heart for a brief period of time fibrillation can be prevented. The early defibrillators used the alternating current which is transformed from normal line voltage up to 300-1000 volts from a power socket to the exposed heart by way of paddle type electrodes. This application of an electrical shock to resynchronize, the heart is called counter shock. If the patient does not respond, the method is repeated until defibrillation occurs. This method of defibrillation is called AC defibrillation. Nowadays this type of defibrillation is not used because it has some disadvantages. This technique was often unsuccessful and showed harm to the cells of heart muscle post mortem. The nature of the AC machine with a large transformer also made these units very hard to move and they tended to be very large units. So DC defibrillators are commonly used now. A scientist named Bernard Lown used an alternating method which involved the charging of bank capacitors to approximately 1000 Volts and then delivering the charge through an inductance such as to produce a heavily damped sinusoidal wave of finite duration. This waveform is called Lown waveform (Figure) and is the standard for defibrillation. 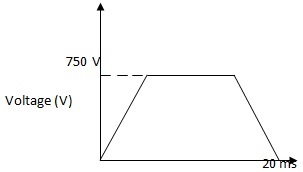 So DC defibrillation method, a capacitor is charged to a high dc voltage and is then allowed to discharge rapidly. The defibrillator is designed in such a way that the capacitor is rapidly discharged through electrodes across the chest of the patient. AC fibrillators cannot be used to correct atrial fibrillation effectively. But DC defibrillator can correct both atrial and ventricular defibrillation. This is an important advantage of DC defibrillators over the AC defibrillators. The DC method requires fewer repetitions and most importantly, it is less likely to harm the patient. The circuit representation of a DC defibrillator is shown below (Figure). The electrodes are the components through which the defibrillator for delivers energy to the patient's heart. Many types of electrodes such as hand-held paddles, internal paddles, pre-gelled disposable electrodes etc. ln general disposable electrodes are used in emergency conditions because they have the advantages such as increasing the speed of shock and improving defibrillation technique. Larger paddles create a lower resistance and allows more current to reach the heart .So larger paddles are desirable. 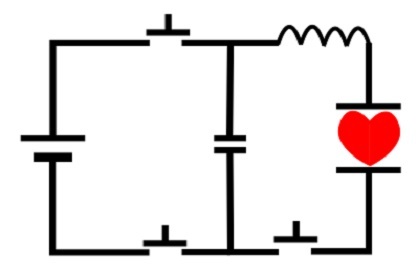 Figure shows a circuit diagram showing the simplest defibrillator desire depending on the inductor damping producing Lown waveform. In a defibrillator, the amount of electrical energy discharged by the capacitor may range from 100-400 Joules. 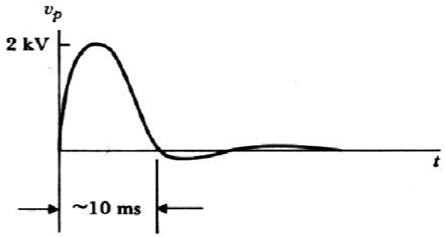 The duration of discharge is 3-5 milliseconds, From the DC defibrillator discharge waveform (Also known as Lown waveform) shown in figure. Numerous studies showed that a biphasic truncated waveform (BTE) was equally effective when requiring lower levels of energy to produce defibrillation. Biphasic defibrillation was originally developed and is used for implantable defibrillators. When applied to external defibrillators, the biphasic defibrillation decreases the energy level necessary for successful defibrillation. So this dual peak waveform of longer duration is having less risk of damaging the myocardium. Biphasic waveforms deliver current that first flows in a positive direction for a specified duration. ln the second phase the device reverses the direction of current. The biphasic shocks appear to achieve the same defibrillation success rates as monophasic waveforms but at a significantly lower energy levels. 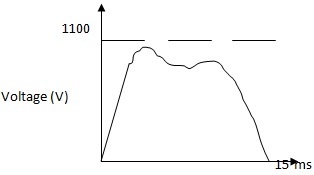 The waveform is shown in figure. Another DC defibrillator wave is the tapered delay wave (figure). It has lower amplitude of around 700-800 Volts and much longer duration than the other two types of waveform. Here the energy delivered to the patient by the defibrillator is proportional to the area under the square of the curve.